You know you’ve sold 600 million books when the government declares your birthday national “Read Across America” day. So happy 112th birthday to Dr. Seuss. Not a real doctor; but a Dartmouth student who got caught drinking on campus (during prohibition), faced expulsion and had to invent a quick name change to get his cartoon published. 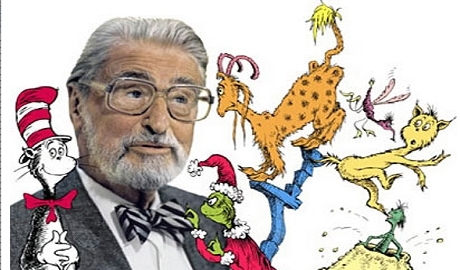 Flash forward; Dr. Seuss remains the 9th most sold author in the history of publishing (J.K. Rowling is number 10) and if he was out to sell his first book today, I bet he'd still be getting a whopping deal. Because he got it simple. And simply, the best brands get it simple. He was my inspiration for reading and writing and branding and he is a brand guru for more than one industry. Many entrepreneurs, authors and even the biggest brands I work with want to “cut their losses” and “try something else” before hitting the finish line. I myself got rejected on my first book over a four year period. My first deal turned into a three book deal and I got 27 thereafter. My most lucrative sale sold in an auction of 6 publishers four days after it was on the market. I believe in stories that simply have to be told. And i believe in our luck. Especially the kind we work hard to run into.